Everything you know about smoke points is wrong. Smoke points are more than just a simple number. Read on to learn why. The smoke point of an oil is the temperature at which the oil starts to smoke. This is not to be confused with the flash point which is the temperature at which the oil vapors will ignite. The smoke point of an oil is important because no one wants to burn their oil. 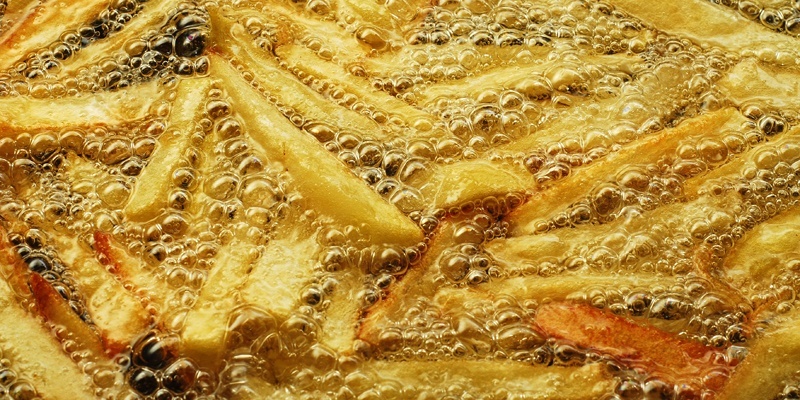 Furthermore, cooking oils release potentially toxic compounds when overheated. To measure smoke point, the American Oil Chemists' Society recommends the Cleveland Open Cup method (9a-48 method). The oil is heated and when light blue smoke is noticed, the temperature is recorded as the smoke point. The problem with this and any method of measuring smoke point is the subjectivity. It is up to the analyst to note when an oil emits smoke. Furthermore, oil smoke points vary greatly from sample to sample. An oil can vary ±70°F in smoke point temperature depending on the age of the oil, field conditions, season, varietal, the level of refinement/filtration, fatty acid composition etc. To correctly report on smoke points, multiple samples of the oil should be measured and the smoke point should be listed as a range. The smoke point charts available on the Internet and published in books are generally based on a single sample. The number you see online is the smoke point of the oil that the analyst measured and may not be the smoke point of the oil you have in your kitchen. This is why official smoke point charts are often accompanied by a disclaimer such as this one. "The values in this table represent typical smoke, flash and fire points for commercially available edible fats and oils. The values are based on a single test for each fat and oil source, thus they do not represent a statistically valid mean or indicate the range of values attributable to each of the source oils. Smoke, flash and fire points may vary within a source oil due to such factors as processing techniques and/or seasonal variations. In addition, there can be analyst subjectivity when using this test procedure (i.e. AOCS Cc 9a-48 method, Cleveland Open Cup)." The surface area also has an impact on the smoke point of an oil. A wide, shallow pan with a thin layer of oil will have a different smoke point than a deep pot. Smoke points should be considered general, not precise, values. Professor Robert Wolke explains this topic in depth in his book What Einstein Told His Cook: Kitchen Science Explained. Here are the smoke point ranges for olive oil and other common cooking oils. Keep in mind that average stovetop cooking is 350⁰F. As you can see, olive oil's smoke point is similar or higher than the smoke point of most cooking oils and high enough for all types of cooking.